Although the holidays are an exciting time of year, you do not look forward to taking pictures with loved ones because you are insecure about the appearance of your teeth. 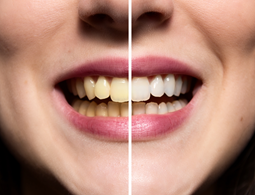 Dark tooth discoloration has caused you to lose your confidence, causing you to often hide your teeth. What if you could restore a bright, white smile just in time for Christmas? Now you can with a professional whitening treatment from your dentist in North Raleigh. The appearance of your teeth says a lot about you. Not to mention, many people form their first impression based on how your smile looks. If you live with dark tooth discoloration, you may feel as though people are judging you while you also tend to be less outgoing. To revamp your confidence, your cosmetic dentist in Raleigh has the solutions you need. It is natural for your teeth to become discolored as you age. However, the severity can also be influenced by the foods you eat, poor dental hygiene, and bad lifestyle choices, like smoking. As a result, your smile can appear to be years older than your true age. To turn back the hands of time, an in-office whitening treatment can give you the results that you want in just one appointment. Unlike over-the-counter whitening products, professional treatments contain a highly concentrated whitening agent to deeply penetrate the enamel to resolve stubborn stains. After performing an initial consultation to determine the cause of your discoloration, a customized treatment plan will be developed. In just one day, your teeth will become several shades whiter. Now, you can also achieve professional-quality results from the comfort of your own home. Your dentist can provide you with an at-home kit to get drastic results over the course of about two weeks. Using impressions, your dentist will give you custom-fit whitening trays to ensure even and consistent results. In addition, you will be given the whitening agent to use at home and around your own schedule. In about two weeks, your teeth will be noticeably whiter. With the right aftercare, you can ensure that your new smile will stay bright all year long. It is best to maintain your oral hygiene and regular care from your dentist. In addition, avoid stain-causing foods, drinks, and bad habits, like smoking. Do not spend another year feeling self-conscious during holiday gatherings. Smile brightly this Christmas season with a professional whitening treatment. You will start the new year with the confidence you need to look and feel your best. Dr. Philip A. Lisk is a graduate of the University of North Carolina School of Dentistry. Since 1997, he has provided general dentistry services to the community to create healthy teeth and gums. In addition to your oral health, he also offers the services you need to feel confident with an attractive smile. If you are interested in whitening your teeth before Christmas, contact our office today to schedule a consultation.